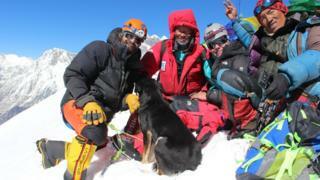 A stray dog has managed to climb to the summit of a 24,000-foot Himalayan mountain. 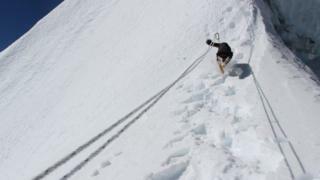 The dog called Mera made it to the top of Baruntse in Nepal without any help and was still able to run around once she had made it. Mera spent three weeks climbing to the summit with expedition leader Dan Wargowsky, from Seattle. The guides accompanying Mr Wargowsky said they had never seen anything like it before. 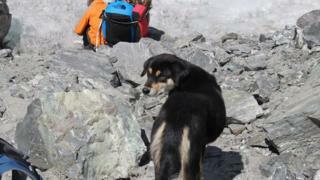 The mountain climbers didn't expect a stray dog to follow them to the summit! The Himalayas are a mountain range in Asia. They have some of the highest mountains in the world. The biggest mountain is Everest. Mr Wargowsky and his team were climbing to the summit of the Baruntse mountain in Nepal. They were surprised to find out that a stray dog had started following them from about 17,000 feet up. Mr Wargowsky named the dog Mera because they had just been to the top of a mountain with that name. The two were inseparable after that and Mera even stayed in Mr Wargowsky's tent at night to stay warm. Mera really impressed the team with her climbing ability and only needed help towards the end of the journey. 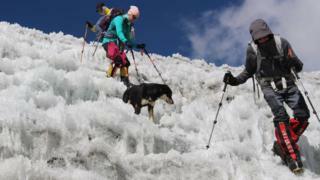 The experienced climbers said they had never seen a dog reach the summit before. 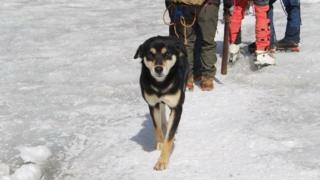 Once she had made it back down the mountain safely, Mera was adopted by the expedition base camp manager. 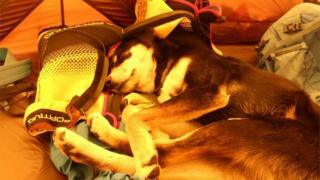 This story has a happy ending - Mera was adopted by one of the team! The Big Question: How do you measure a mountain?